3. How are you living? 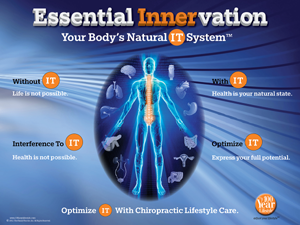 Is your lifestyle supporting you in function and feeling at your highest level for a lifetime? If not, you may be headed for a roller coaster ride of deterioration that could last for decades. Through The 100 Year Lifestyle education and chiropractic care we provide, you and your loved ones will be able to answer the "How are you?" question with gusto! and enjoy the long, healthy, quality of life you deserve.